It seems the storms have passed us by and everyone is trying to get back to their regular routine. Many of our fellow Alabamians are picking up the pieces from Monday evening's tornados. Please keep those affected by the tornados in your prayers. Our morning paper was filled with pictures from Coxey and Athens, Alabama, where the tornados wreaked havoc. As I was reading the paper I came upon an article that related if your home is damaged or destroyed by a tornado it is your responsibility to clean up the damage. How overwhelming to someone who has lost everything! Fortunately we have many great citizens who go out and help with clean up and my hat is off to those wonderful folks. Now on to the post about my BOYS...my little grandsons. 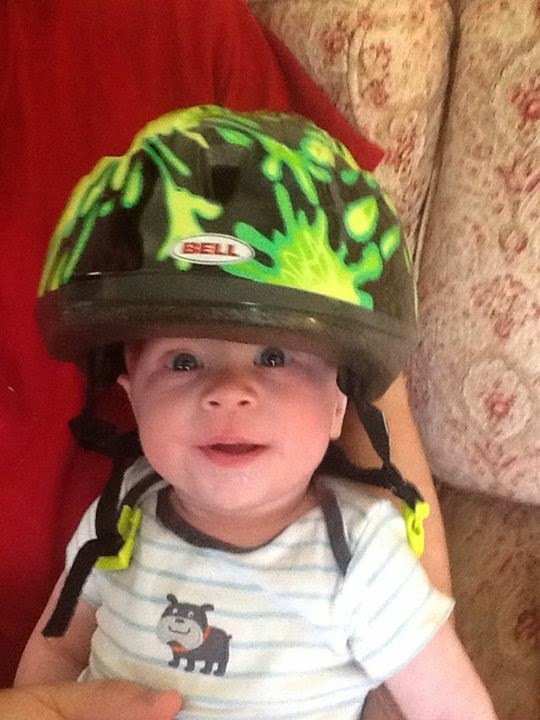 Here is a picture of Elliott in his helmet!! He is ready for tornado weather. I just love that little face!! Here is Baylor, checking out an Easter Egg. Amelia took this photograph at Landon's ball game on Saturday. 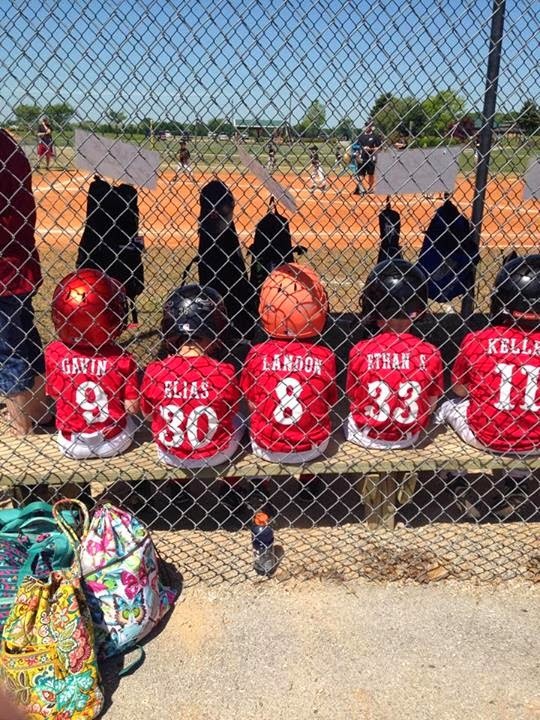 I think it is so cute...there is my favorite player, number 8!! Have a great Hump Day...the weekend is in sight!! Last night was a stormy one for the residents of NoAla. We had been warned that Monday and Tuesday would be bad days. So we were watching the skies. I had a dental appointment in Huntsville at ten am so I drove over there to get my dental work completed. My dentist relayed to me that all afternoon appointments had been cancelled...it does not take much to get someone to put off going to the dentist he joked. I had a few errands to run and the sky was clear so I did not get home until one o'clock in the afternoon. Around four the weather began to turn nasty. Marvin came home from work and I texted all my children to make sure they were safe. Priceville just had rain, thunder and lightning but to our north several communities took a direct hit. Two people were killed in Athens. They lived in a mobile home park and refused to go to the storm shelter. Many of our communities have storm shelters open during tornado weather. Some folks have had small tornado shelters built on their property. Check out my blog friend Myra's post at My Blessed Life,she had a shelter installed just recently. Most of us Southerners have a healthy respect for tornadoes. After the terrible storms of three years ago, most Alabama residents have a tornado plan and have learned to have extra supplies on hand in case the electricity was off for multiple days. Ben, Katy and their little ones were in their basement at 11:45 last night when I got a text asking me to pray as a large tornado was on the path to their home in Bluff Park. Katy texted me about ten minutes later to tell me that the tornado fizzled out before reaching them!! Thank you God for answered prayers!! Local schools are out today. I will have Landon and Kendall here with me unless Amelia's work place is closed. Poor Landon is not feeling well but we are not sure if his pediatrician will be open today. Everyone is in the batten down the hatches mindset. More storms are predicted for this afternoon. Please say a prayer for us!! This year I knew what I wanted for Mother's Day! Some additional pantry storage for my garage. My pantry is small, located under the back stairs. and it needed help. The pantry has wire shelves and even though they are anchored into the studs, I was worried about the shelves giving way. I had the pantry so full that even walking inside it was an adventure. So Marvin and I headed to Lowes and looked at some of the garage storage cabinets available there. I found what I wanted and Marvin purchased it for me. I spent all day assembling this big boy...and some fussing was involved!! The finished product looks just like the picture on the box however so I am a happy girl. And here is the inside...very neat and tidy for now!! My inside pantry is also neat and I can actually walk inside it once more!! I love being organized so this makes me very happy!! Now I need to get to work on a few other household projects at Nanaland. We are off to the Ball Field in a few minutes to see Landon and the Red Sox play ball this morning so I am just posting a few random pictures today. 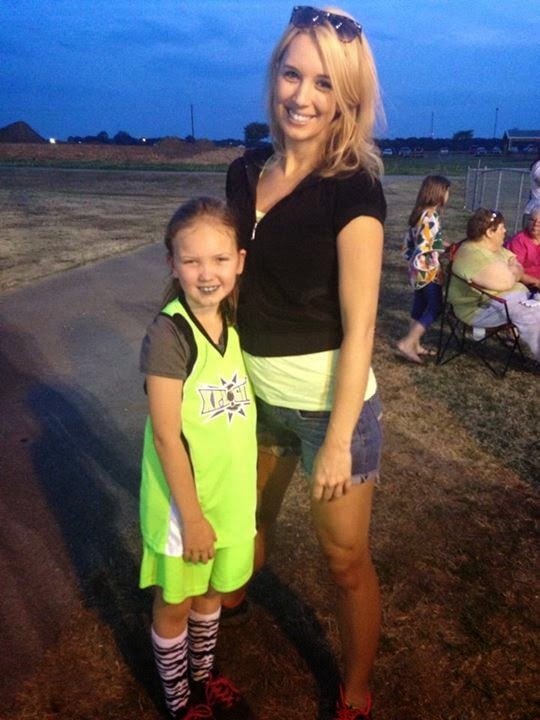 Amelia and Kendall at Kendall's ball game Thursday evening. 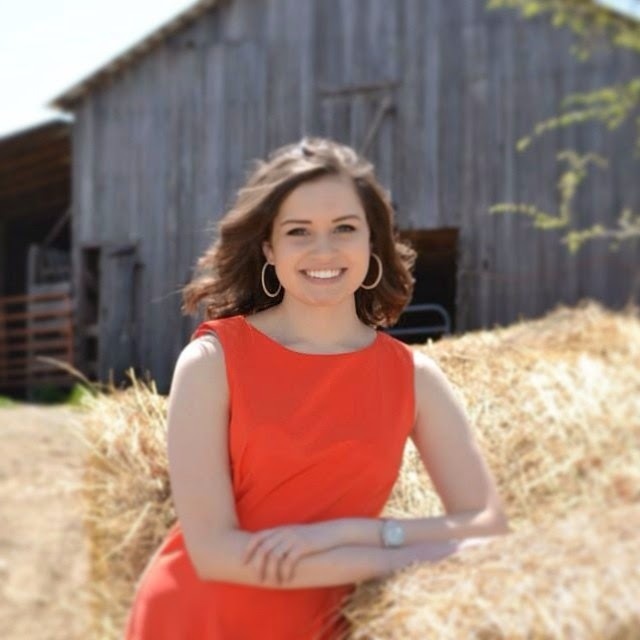 A picture of my niece, Laura, taken in front of my Daddy's barn on Easter Sunday. Kendall opening up her cards from Aunt Leta, Uncle Bruce and Laura. A shopping trip is in our future!! A picture of the ladies at my YLEO informational meeting the other night! Just a quick glance at a week here in Nanaland. Have a blessed weekend friends!! I Love my Garbage Bin!! When we purchased our townhouse five years ago, it was pretty much a builder grade home. It had a few updates and Marvin and I knew we could gradually put our own stamp on it by adding some things and painting a few rooms. One thing that it did not have was one of those built in garbage container. You know, it looks like a cabinet door, you open it and it conceals your garbage can. For five years my garbage can sat out in my kitchen, mocking me. I was having lunch with my friend, Terry, at her home not long ago and she showed me her little secret. 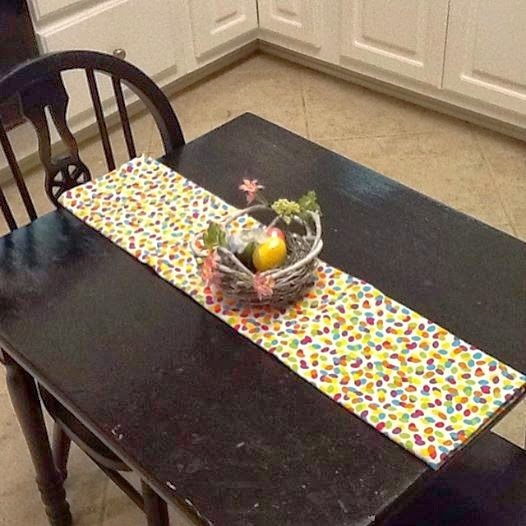 her garbage can was hidden away in a piece of furniture in her kitchen. She had purchased hers years ago and she was not sure if Sears still offered this perfect little piece. When I got home, I started "googling"....one of my favorite occupations! I found what I was looking for at Sawdust City in Wisconsin. I put in my order and hoped that it would look as good as it did online! I did not have to wait long for my package to arrive. One afternoon as I was puttering in the kitchen, friend, Susan, from down the street texted me that there was a big package on my front porch. As Susan drives down the street, she goes right by my house and often she will spot a package out front before I do!! And there it was...my garbage bin!! Marvin helped me to get it inside and to open it up. It was packaged very well, no dings or scratches on my new toy! It settled in right next to my hutch!! I love the little shelf for extra garbage bags!! I added this sweet little owl to the knob. I found Mr Owl at Cracker Barrel in December. He was a Christmas ornament but I loved him so much I kept him on display in the laundry room. Now he resides in the kitchen where he keeps me company as I work. I guess I am easy to pleas...nothing makes me happier that some new organizational product and I LOVE my Garbage Bin!! I have lots of blogs I enjoy reading. You will see most of them on my sidebar listed in an orderly fashion. One of my favorite blogs is My Blessed Life. Myra writes about all the things I like, home, decorating, faith and family. Some of her posts share about her love for Young Living Essential Oils. I would read them and think, Well that is nice for her but I am skeptical. In nursing school, we were taught to have a rationale for every treatment that we performed on our patients. That rationale was backed up by lots of research in our text books. Then another blog friend, Jenn, who writes Sweet T Makes Three, got onboard the oily wagon. From my time as a mentor at our MOPs group, I knew that many young moms were becoming more pro active and adventurous in caring for their families. Many moms were sick of their kiddos being sick all the time and were tired of the constant stream of antibiotics that physicians prescribed. And I agree with them that too many antibiotics are a bad thing. It can lead to resistance to the drugs and it can certainly wreak havoc with a little one's intestinal track. I was beginning to wonder what this oily business was all about. So I ordered a Young Living Essential Oil starter kit hoping it would help me to find relief from the insomnia that plagues so many aging baby boomers. Using Lavender and Lemon in my diffuser every night has helped me to sleep once again. I branched out into using Thieves oil to help protect myself against the bugs that seemed to be everywhere in February and March here in NoAla. And then on to using Thieves Cleaner to replace all the chemical cleaners that were fuming up my home on cleaning day. My husband who calls me An OLD HIPPIE, loves the Peppermint oil. He suffers from night time stuffiness and Peppermint oil has helped him with that. He also likes the diffuser as it helps him to sleep better as well. Now I have had time to do more research and reading on oils and their uses and I have become a believer in being proactive with oils. They cannot replace all medications...I would never advocate for a person to give up their essential meds. I take medication for hypertension and thyroid issues and I will continue to take them as my physician has prescribed them. But I am all for being healthier and I think the oils promote a healthy lifestyle. When my friend, Jenn, suggested that we do a YLEO party here at my home, I was on board. I want to share what I have found with my friends!! Here is my door prize basket...filled with samples of Young Living Essential Oil Products. I can certainly endorse the Detox baths. Add some essential oil to Epsom Salts, take a nice relaxing 20 minute soak in the tub and you will be ready for your jammies and a nice soft bed. I also included a few other samples of YLEO products. I am hoping all my friends find that essential oils can make a difference in their lives! Looking forward to some fun, fellowship and lots of learning this evening!! Son Charles and Daughter in Law, Nancy, celebrated Nancy's 30th birthday with a week long trip to Orlando, Florida and all the great theme parks that are located there! Charles had assured me that he would bring me something from the Harry Potter Experience. On Sunday, he and Nancy made good on their promise and what should appear but a Chocolate Frog, along with a Godric Gryffindor collectible card. Unfortunately my frog did not have even one good jump in him!! ( You Harry Potter Fans will understand!) Thanks for a little bit of magic from Honeydukes Charles and Nancy!! I am a few days late posting these photos. After Kendall's birthday party, Amelia and Todd hid Easter Eggs for the Grimmlins. Todd hands out shopping bags to use to collect the Easter Eggs. Baylor takes a moment to check out his egg! Elliott watches the fun with Grandpa. Sneaky Uncle Charles ran away with Landon's bag of loot.....Landon chased him down and got it back. What a fun afternoon with the kiddos...big and small. We celebrated Kendall's 8th birthday on Saturday. Her actual birthday is Friday, the 25th so she will celebrate again then as well! You cannot have too many birthday celebrations. The theme was Frozen and Kendall wore her Princess Anna costume. Mommy did a great job decorating for the Frozen party. Nana got a chance to love on her princess!! Kendall had fun opening her "big" gift which included box after box until she reached her Ipad mini. Margaret found this princess hat upstairs and put it on to enjoy the festivities. Well I did get a picture of all five grands....Landon blinked, Baylor was less than happy to stand with the group and Margaret is looking at Baylor!! It is a great picture of Kendall and Elliott!! Oh well this is real life. While I would love to have a beautifully posed picture of all five in matching outfits, this will have to do for now!! It probably depicts my crew perfectly!! This is the Grimmlin photograph!! Our sweet baby boy, Elliott!! The birthday girl blows out the candles on her cake. May all your wishes come true Kendall. 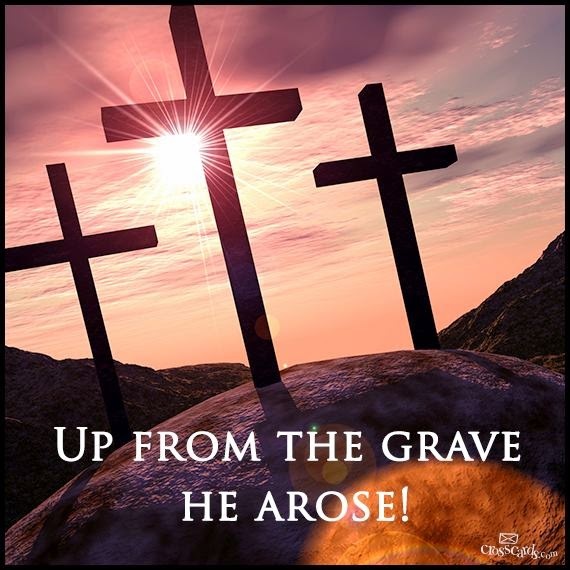 Up From the Grave He Arose is one of my favorite Easter hymns!! Thanks to my friend, Curt, for sharing this image on his Facebook Page so that I could share it on my blog. If you have not seen the video, The Easter Hallelujah by Kelley Mooney.....please google it and listen. Tears ran down my face as I listened to this beautiful rendition of a secular song. Leonard Cohen wrote the song, Hallelujah and Kelley Mooney wanted to write a spiritual version of Jesus's death and resurrection using his music. Well all I can say is that she did an outstanding job. (Miss Mooney did wait two years to get his mechanical rights to the music so she followed all the rules!) I downloaded The Easter Hallelujah to my Itunes and I know I will listen to it quite a bit this weekend. My hubs, Mar, who is a music expert, agreed with me that this is a great song. I am going to take tomorrow off to celebrate the Easter weekend. We have Kendall's 8th birthday party tomorrow and all my children and grandchildren will be there so I am one happy camper. Hoping to get a photo of all five children together. Kendall has offered to hold Elliott!! I am going to take my sis in law's suggestion and carry a bag of skittles to pass out to get them to sit and cooperate. Have a blessed Easter dear friends. He is Risen!! He is Risen Indeed!! I had reported earlier in the year that Angela Lansbury and Penelope Keith would be receiving the title of Dame for their achievements in the arts. And this week it happened in London. 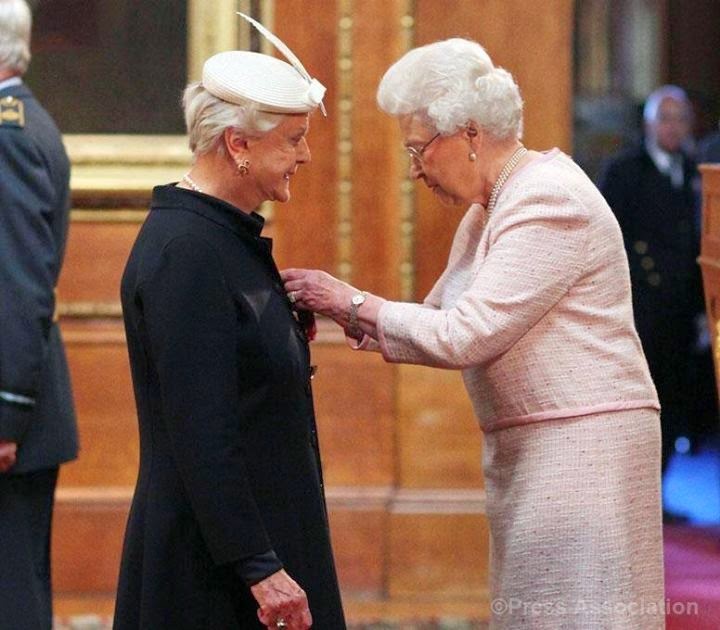 Here is a picture of Angela Lansbury receiving her honor from Queen Elizabeth. I hope I am as active as these two are when I am an octogenarian. For those of us who know and love Miss Lansbury, you might be interested to know that she was born in England and holds dual citizenship in the United States and Great Britain. Here are the two lovely ladies!! If you love Brit Coms, you will be familiar with the name, Penelope Keith. Ms Keith starred in Good Neighbors and To the Manor Born which can be seen here in the states on many PBS channels. 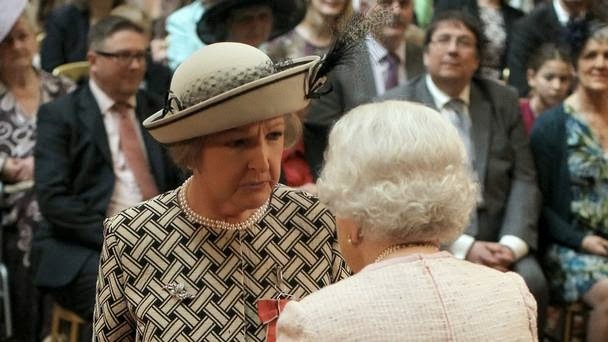 Penelope also received the title, Dame Penelope Keith. Here she is recieving her medal from the queen. What an honor for these two actresses!! Both ladies have given me much pleasure with their acting capabilities and it is good to see them rewarded for their services. Is That a Pear I See?? Everyone who knows me well, knows that I have a thing about Pears. I just love them...not to eat in particular but to collect pear items of all shapes, sizes and colors. ( Yes, my friend, Susan, found a large lavender pear for me and it now resides on top of the armoire in my bedroom.) So when I was cruising through Tuesday morning the other day, I saw this sweet rug and knew it was calling for me to purchase it! I have a rationale for every impulse buy!! See what I mean?? ?I could not resist!! Well after working on this sampler since December I am finally finished with my project. It is such a small sampler that I am ashamed it took me this long to complete the stitching. Now it is off to the framer and hopefully Katy will have it soon so she can hang it up with Margaret and Baylor's samplers. Elliott is so "new" that I am still getting used to seeing his name in print!! Marvin had received some papers in the mail and Benjamin E Grimm was included in the grands names and he said it startled him as well!! Love that little man and looking forward to seeing all the Bham(Hoova) grands at Kendall's birthday party on Saturday. One of the reasons I was able to complete this needlework is that Marvin was sick all weekend and we were stuck inside. I was determined to make the most of the confinement. I also received two nice Happies in the mail on Saturday. My canvas of Margaret and Landon arrived!! Not sure where its' final home will be but love seeing these two smiling faces. They are best buds. The Easter Card on the right came from a sweet blog friend who makes her own cards!! That makes them extra special. The one on the left is the one she made last year. I hope I am starting a collection of Gina Cards. It is a rainy morning here in NoAla. I would normally be glad for a rainy day. Rainy days are perfect for puttering about the house, doing little chores and taking a break to read a bit of a book. But today I have a dental appointment in Huntsville. My dentist, Dr Cook, is going to begin work on a crown for me. Oh if it were only the kind of crown that Queen Elizabeth wears, however mine is not. My crown requires novacaine and at least an hour in the "chair". This will be the first dental work that I have had done by Dr Cook as he took over the practice of our former dentist, who retired. So that makes me a little apprehensive. Let's just put it this way, Dentists give me the heebie jeebies. You would think that in the 21st Century, Dental Work would not be a PAIN!! But after going to the dentist, I am going to stop at the library, which is one of my favorite places in Decatur. I am returning season five of Foyle and I will pick up Season Six. Marvin and I have really enjoyed watching Foyle's War. We also watched the movie, The Best Exotic Marigold Hotel over the weekend. It was an interesting film about the outsourcing of old people. Any film with Maggie Smith and Judi Dench as stars must be good. And today is also the beginning of Holy Week for Christians. I want to take time this week to really focus on my faith and to remember how blessed I am to be a believer and to be able to declare on Easter Sunday, He is Risen, He is Risen Indeed!! I was able to deliver Happies to my friends, Terry and Amy, yesterday as we lunched together! This Easter Season, I decided I was going to share Easter Cards with my friends and family. Back in March, I started collecting cards from various stores and stashing them in my stationery box! What fun to choose special cards for special people! ( I know cards are pricey these days but I have to say that I found some lovely Easter Cards at Dollar General Store. Some were 2 for a $1 and the most expensive were $1. Dollar General will be getting a lot of my card business from now on!!) I think cards qualify as Happies too. Who does not like to open the mailbox and see a handwritten envelope hiding among the generic mail? I have three big hat boxes on top of the armoire in my bedroom and they hold notes and letters from over 30 years. Every now and then I love to take them down and read through the lines written by friends and family. Some of them have gone home to be with the Lord so their cards are so precious to me now. In closing, I had to share some of the cute cookies and candies I picked up at Mel's Sweet Treats yesterday. Mel's is THE place to go if you are looking for a yummy treat or a little happy for a friend. I have already eaten the top half of my bunny!! Marvin is not feeling well so his bunny remains intact. I also got some Martha Washington Truffles. Samples of the Truffles were out for customers to try and it convinced me I had to get one for me and one for Marvin. They taste like the homemade Easter Egg Candy that Mama G would make for us at Easter Time. Mel's Sweet Treats serves yummy lunches as well and Terry, Amy and I can testify to that. If you live in the Decatur area, check out this "sweet" store. Since the day that Lanier, my friend and Sis in law, introduced me to the concept of "Happies" I have been all about this gift giving idea. I really enjoy finding small gifts to share with friends and family. (That is why I love to search through TJ Maxx and Ross!!) With Easter coming up soon, I have a few happies to buy for Kendall and Landon's teachers. Thanks to Cracker Barrel for helping me get a cute happy for each teacher. The sweet gift wrap lady at the Hartselle Cracker Barrel put together these cute happies for me! You can choose from any of their treats and she will bag them up and add a cute bow. I decided to photograph them next to my Fake Chocolate bunnies that were Mama G's!! If they were real chocolate bunnies they would not make it very long around me! Happies make any day a Special Day!! Sing Along with Patch the Pirate!! When my three children were young they were introduced to Patch the Pirate at Triana Village Baptist School. In fact, Patch visited the school when Ben and Amelia were in Kindergarten and First Grade. I had never heard of Patch but from listening to the songs my children learned at school, I knew his tapes(Old School) were worth investing in for character building. To be honest, Charles enjoyed the songs more than Ben and Amelia and he owned a basketful of tapes. He would often go to sleep at night listening to Patch. Fast forward 20 something years and now my grands love to listen to Patch on CDs. We always listen to Patch as we are on our way to school or out doing errands. Kendall's favorite CD is The Friendship Mutiny while Landon has a new favorite...Stickyfoot. Landon told me that when I was reading to him about Stickyfoot from the Majesty Music catalog, he thought Nana was saying Stinkyfoot. You know that is a CD that any little boy would love. :) Each Patch CD imparts some character building message in a way that children(and Adults) can relate to as they sing the songs. The Stickyfoot CD message is Bitter to Better. I don't know about you but that is a lesson I can relate to in my life! Here is a picture from the catalog.......Stickyfoot is a legendary creature up in the Lake Champlain area of the United States and he leaves big footprints filled with maple syrup. He is scaring away tourists so he must be stopped. Patch the Pirate and his crew of sailors are up for the job of solving this mystery. One of our favorite songs on the CD is Wah Wah Wah Call the Wahmbulance!! Landon sings it so much that I go to sleep at night with it echoing in my head until I go to sleep! Here are the words. Wah Wah Wah Call the Wahmbulance. A pity party's starting any minute. Wah Wah Wah Call the Wahmbulance!! It is a cute song with a lot of truth to it! I appreciate Patch so much for all the fun and Biblical messages he has imparted to my Children and my precious Grandchildren. God Bless You Patch the Pirate!! Mr Bunny died suddenly yesterday after falling from a table. He had been a faithful Easter Bunny decoration in the Grimm Home for many years. Bubba Ledlow, who knocked the table, resulting in Mr Bunny's death was very sorry about the accident. Fortunately Nana had adopted this bunny just last week from her good friend, Terry! Miss Bunny was happy to step in and replace Mr Bunny. Miss Bunny is a wooden bunny and she should do just fine around the rambunctious grandson, Bubba. Take care, Miss Bunny!! 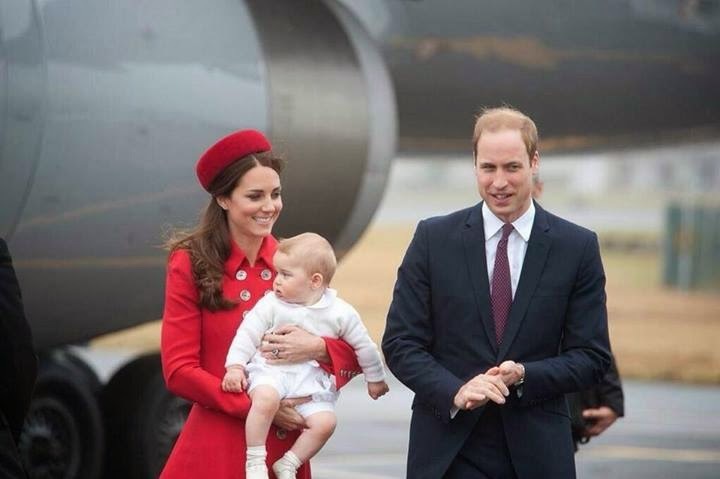 When William, Kate and baby George stepped off the plane in their tour of Australia and New Zealand, I think we were all happy to see a good picture of little George. What a cute baby! He reminds me of his mom and his dad. I am old enough to remember what William looked like when he was a baby!! :) And to think this little fellow will one day be the King of England. I had to smile at the hoopla created by the little sweater that George wore in a recent family photograph...his blue sweater had his name emblazoned across the front. Of course every mummy in Great Britain wanted to get that sweater. I remember a sweater that his grandmother, Diana, wore back in the day that made everyone dash out and try to find one just like it. 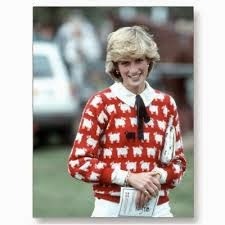 I must admit my 20 something heart longed for a sweater just like Diana's!! 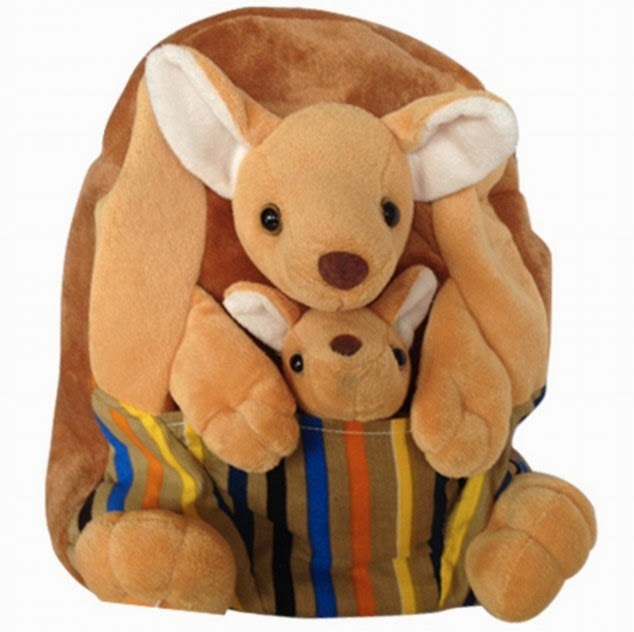 And now I hear that there has been a run on the little kangaroo back pack that arrived in Australia with the young prince. Oh how we all fall prey to the fashions of the Royals!! I don't know about you but I am looking forward to seeing more pictures of the young Royals and baby George as they travel down under!! Saturday was the perfect day for ball games. Bright and sunny but not hot!! 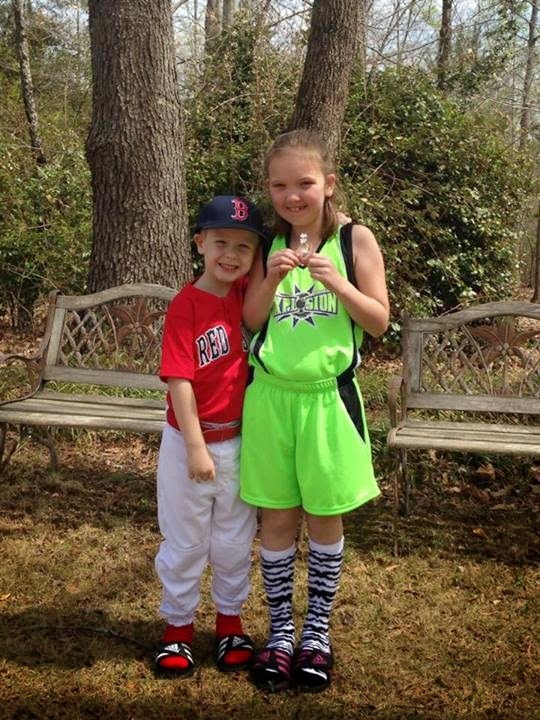 Here is Landon in his Red Sox uniform while Kendall is dressed in the eye dazzling colors of the Priceville Explosion. 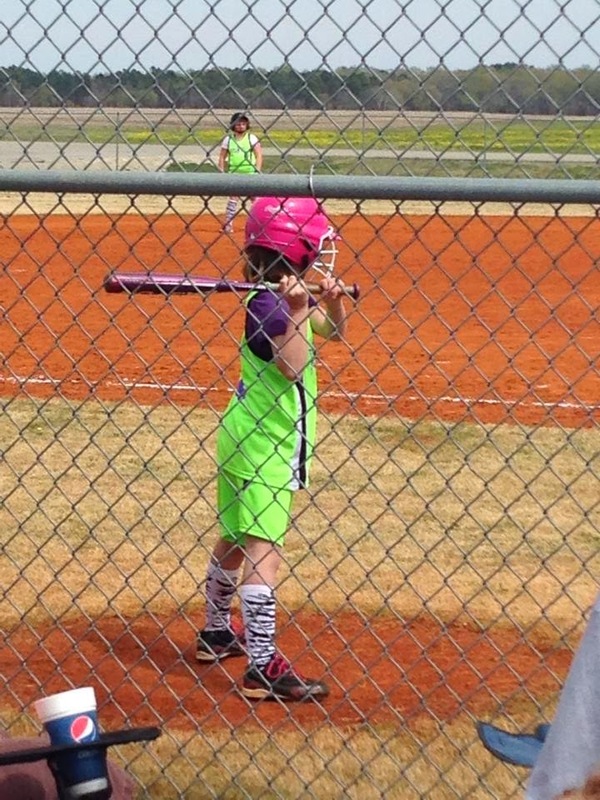 Here is Kendall warmin up to bat!! Here are the Explosions in all their purple and neon green glory!! Love their fancy socks too!! Bubba in the dug out, ready to play some baseball. Bubba has the stance down!! One way to keep up with your glove!! 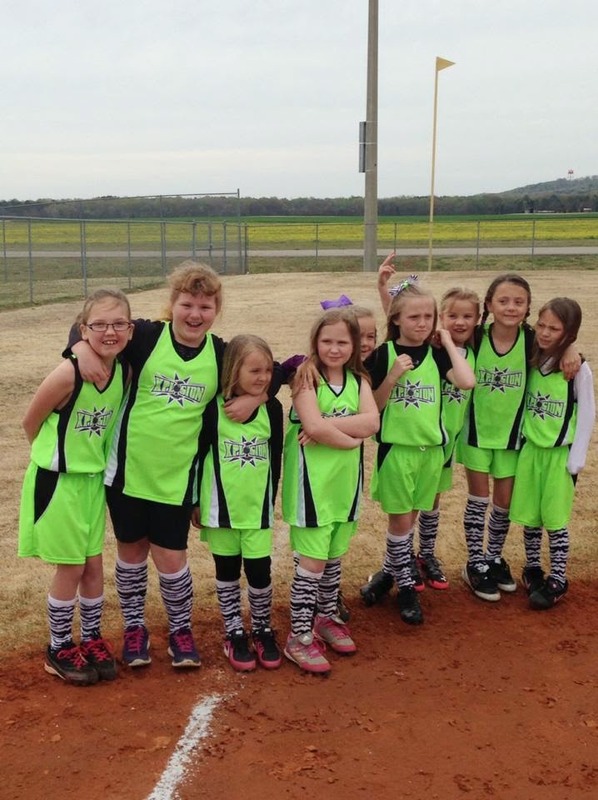 My hat is off to all the coaches who are working with these little ones. They have infinite patience with them as they are teaching them the sport. Grandpa and I will be spending more time at the ball field in the months of April and May! !